We first meet Elihu Hoopes on October 1965, six months after his brain has been ravaged by encephalitis fever. 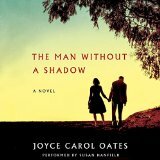 Elihu Hoopes is The Man Without A Shadow – a deeply fascinating new novel by Joyce Carol Oates that I had the great pleasure of narrating for HarperAudio. Within its poignant pages – the science of the mind, love, loneliness, passion and regret are all beautifully examined. Elihu, at the age of 37, incurs damage to the hippocampus area of his brain, which prevents him from being able to form short term memories. Over the next 30 years, Elihu (E.H.) becomes the most famous amnesiac in history while the neuroscientist that is studying him, Margot Sharpe, becomes equally famous for her experiments on E.H.’s mind. While Margot soars professionally, personally she slowly slips into madness allowing herself to fall into an unethical love affair with E.H. An affair that Elihu Hoopes doesn’t have the ability to remember and one that leaves Margot Sharpe, even lonelier than before. The Man Without A Shadow is now available on Amazon and Audible.com. This entry was posted in Audio Books, Narration, News and tagged Amnesiac; Amnesia; Neurscientist; Neurological; Encephalitis; Memory; Momento; Brain; Science; Science of Memory, HarperAudio; Joyce Carol Oates; HarperCollins; Audiobooks; Narrator; Susan Hanfeld. Bookmark the permalink.